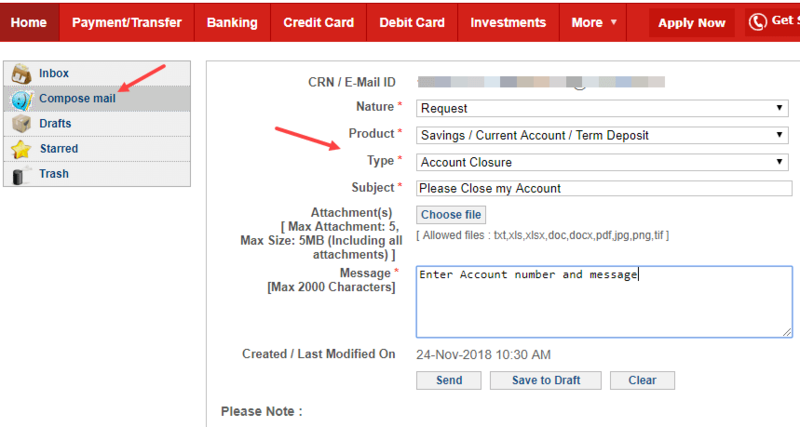 Now you can submit Kotak account closer request online through net banking. If you wish to close your Kotak Bank Saving or current account then login to net banking and submit an online request. Before your submit account closure request online, make sure your account balance must be NIL. (2) After login, click on Get Support and then click on Inbox. (3) And now click on Compose Mail. Now select Request in Nature. Select Saving/current account option in the product. In the type of request, select Account Closure. Type “Please close my account” in the subject. Enter account details and your message. And finally, click on Send and submit your request. Your request will be fulfilled within 10 days. You can also submit an offline request by visiting your home branch. Fill this account closure form and submit to branch including chequebook, Debit card. If you are closing your Kotak Bank account due to MAB then let me tell you Kotak Bank also offers 811 zero balance saving account. You don’t need to maintain Monthly average balance in 811 account. You can apply 811 saving account online.